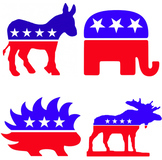 Students of Government or AP Government can delve into the political differences between Republicans and Democrats. TSW analyze the similarities and differences in party structures and leadership. Political Parties & History! 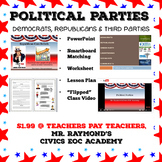 Learn Origins & Evolution of Political Parties! 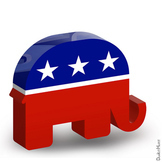 Political Parties: Find out if your students are conservative or liberal! Just after Washington warns his fellow Americans against political parties, they begin to emerge with Jefferson and Hamilton. 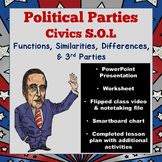 This worksheet includes a short reading passage about the two different parties (Democratic-Republicans and Federalists) and a chart to sort both parties' characteristics. 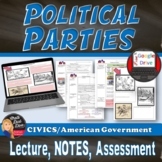 Included in this file are seven short answer worksheets focusing on the nature of political parties in the United States, as well as their relationship to interest groups and the media.These worksheets cover all the material a student needs to know in order to succeed on the AP US Government Exam. Political Party Timeline Warmup. Includes timeline and two questions per day (10 questions total) on the student worksheet. Tips on how I do the bellringer are included as well.